Ernest Shults, nearly 100 years old, took his "last flight" Friday, October 3, 1997. A mechanic with the U. S. Air Mail Service, Ernest loved working with aircraft engines, on and off the job. In retirement he rebuild antique airplane engines "just for fun," as he told a newspaper reporter in 1971. "I build them down and build them back better than they were." Ernest (shown at left with his wife Marie in 1989) launched his aviation career in World War I as a navy submarine spotter flying pusher airplanes off the coast of France. His duties included carrying two passenger pigeons on each flight, one to be released halfway to his destination and the other when he arrived. The problem, as Ernest pointed out to his commanding officer, was how to release the pigeons without their striking the props. He solved the dilemma by stalling the plane, then releasing the birds just as it started to lose altitude. As the birds' natural inclination is to climb, they cleared the props with all their feather intact, happily finding their way back to home base. Following his employment with the Air Mail Service and later Boeing Air Transport, Ernest became a co-pilot and mechanic for Phillips Petroleum Company's Ford tri-motor executive transport. It was during this period he met and made friends with Wiley Post. Ernest worked with Post to prove that airplanes could fly transcontinental at altitudes of 35,000 feet. Post used his airplane "Winnie Mae" for the test flight, which in 1935, after two aborted tries, proved successful. After Post, along with Will Rogers, crashed and died in Alaska, Ernest and his wife, Marie, helped haul the famous plane to the freight depot to be carted and sent to Washington, D.C. where it resides in the Smithsonian Institution. Ernest's career included time with United Air Lines in Cheyenne, Wyoming. Through the years he was associated with various other companies besides Phillips Petroleum, such as Aero Underwriters Insurance Association, Allison Division of General Motors and Pacific Airmotive. Among Ernest's credits are the many engines he rebuild for air races all over the country. Louise Thaden, the first woman pilot to win the Bendix Trophy Race, used an engine Ernest rebuilt. 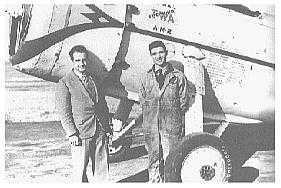 He was instrumental in building sky writing equipment for Art Gobel, the pioneer skywriter and aviator. Retirement to Ernest met doing the things he loved the most, rebuilding airplane engines He also kept active as a member of the Air Mail Pioneers. Ernest and Marie celebrated nearly 77 years of marriage before she died in 1996. Marie Shults and Mae Post tow the 'Winnie Mae' to a box car that loaded Wiley Post's famed plane for its destination at the Smithsonian National Air and Space Museum. The 'Winnie Mae' had completed two around-the-world flights and numerous sub-stratosphere expe rimental flights that earned it a place in "outer space" exploration history. The date of the photo was Nov. 1935, three months after Wiley and Will Rogers crashed and died in Alaska. Was the man who knew how to fly. To be sure these pilots all earned it. To fly you have to have guts. On wings with baling wire struts. And we've read of his flight to fame. And wings are not easily won. Is the man who put them there. PHOTO: Ernest Shults (right) and Paul E. Garber, first curator of the Smithsonian National Air and Space Museum, discuss shipping the 'Winnie Mae' to Washington, D.C. after a distinguished career in the early history of commercial and explorative aeronautics.